Jonezy is released in brand new 11 track album called ‘ULP’ which will include the hits ‘Champion’ ‘Lives Not Knives’ ‘Mighty Plan’ and many more!! Details about pre-ordering will be announced soon. ALSO Jonezy has also announced his upcoming performances that he will attend over 2018. Read about Jonezy on his profile page. See Jonezy at his next show. Find Jonezy on social media. Book Jonezy for a show. See which gigs Jonezy has been to. Jonezy is a 26 year old mixed genre Artist & songwriter from Leicester. He brings a creative and positive vibe to all music scenes, with strong interactive live performances. Jonezy has molded multiple genre’s he loves into his own style & approach that is open to all audiences. Offering clean, exciting and energetic performances with positive messages. His unique approach to music has attracted allot of attention, allowing him to support & perform alongside high profile acts including UK chart bands The Vamps & OPM plus more acts such as The Trinity Band and Shystie. Started setting his values through his songs, he has comfortably broken into the Leicester Music scene and continues to reach audiences across Leicester. With his fan base growing, expect big things from this great up and coming artist. From a young age Jonezy started setting his values through his songs, he has comfortably broken into the Leicester Music scene and continues to reach audiences across Leicester. Jonezy started performing at the young age of 13. For many years Jonezy practiced and prepared for the day he would release his first album; March 2011 at the age of 19 he released his debut album ‘My Way Of Music’. Jonezy took a experimental approach towards his first album, trying out various genres including Funk, Pop and Rap. The album was received well and had plenty of positive feedback, but Jonezy knew that he can do a lot better, and with that motivation released his second album ‘This is Me’, October 2012. The album generated a really good response from both fans and media. In 2013 Jonezy’s activity mainly comprised of live performances and building public awareness. He performed in front of hundreds to thousands, supporting huge acts such as The Vamps, OPM, The Trinity Band, Shystie. This very same year, Jonezy expanded his fan base further abroad into Europe, performing live in Norway. 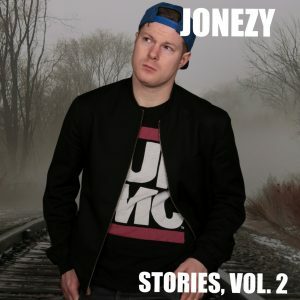 Jonezy has just released his third album ‘Stories’ which has received some great reviews.